Some demonstrators ripped up paving stones and threw firecrackers at police while shouting slogans calling for President Emmanuel Macron to resign, Owojela's Blog learnt. Interior Minister Christophe Castaner accused the demonstrators of being influenced by the leader of the far-right National Rally party, Marine Le Pen. But she accused him, on Twitter, of dishonesty. 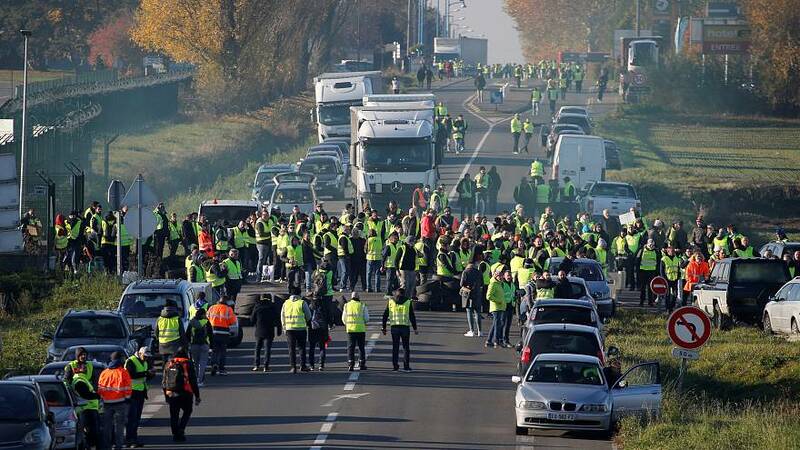 Mr Castaner put the number of people taking part across France at 23,000 by 11:00 (10:00 GMT) - much less than the first day of Yellow Jacket protests, which drew some 280,000 people a week ago. What lies behind the protesters' anger? World oil prices did rise before falling back again but the Macron government raised its hydrocarbon tax this year by 7.6 cents per litre on diesel and 3.9 cents on petrol, as part of a campaign for cleaner cars and fuel. The decision to impose a further increase of 6.5 cents on diesel and 2.9 cents on petrol on 1 January 2019 was seen as the final straw. The president has blamed world oil prices for three-quarters of the price rise. He also said more tax on fossil fuels was needed to fund renewable energy investments. In another sign of the tension sparked by the protests, a man was arrested on Friday in eastern France after threatening to blow himself up with a grenade unless he was granted a meeting with President Macron. The 45-year-old, wearing a yellow jacket, was confronted in a car wash in the town of Angers but surrendered to police after several hours of negotiations. All drivers in France have to carry the jackets in their cars as part of safety equipment for use in a breakdown. Along with the familiar red reflective triangle which must be placed behind a broken-down vehicle on the side of a road, the high-visibility jacket - or "gilet jaune" - must be worn by the driver outside the car. Failure to wear the jacket after a breakdown or accident can result in a €135 (£120; $153) fine under a law introduced in 2008. Synonymous with driving, the jackets have now morphed into the uniform of the movement against higher fuel costs. This is a protest from the social media age, which means there are no real leaders, no real demands and no-one is quite sure how many will turn up or where in Paris. They've been offered rallying-points by the Eiffel Tower and in two big squares in the east of Paris, but there are fears that without any focus, the protesters could break up into myriad small groups - much harder to manage especially if, as is far from impossible, trouble-makers try to join their ranks. The protest may be amorphous, but the anger is real enough. Its heartland is what's become known here as the France of the periphery: that is, the thousands of small towns across the country where people depend heavily on cars to get to work and to shop - and feel their values are ignored by the sophisticated rule makers of the capital. There were protests at more than 2,000 locations across France. Two people were killed and more than 600 injured. At least 50 people were also arrested, although most of the protests took place without incident. Several of the injuries and one of the fatalities came when drivers tried to force their way through protesters. The second death was that of a male demonstrator on a motorbike who collided with a lorry.